Aizawl, May 16 : With Cyclone Mahasen likely to hit the State on Thursday night, the Mizoram Government has decided to close all schools on Friday and declared a half-holiday tomorrow. State Education Secretary K Lalnghinglova said today that a circular to this effect has already been issued and circulated to the head of the institutions of government schools as a precautionary measure. Lalnghinglova, however, said the government had not taken any decision to close government offices. Meanwhile, Principal Scientific Officer of the State Planning Department’s Science and Technology wing Vanlalzara said the cyclone was not likely to hit northern parts of the State. Quoting data from the Regional Meteorological Centre in Guwahati, Vanlalzara said Cyclone Mahasen was likely to hit the southern part of the State – Lunglei and other southern districts. “Though we have received information that the cyclone picked up speed, we hope that it would eventually slow down when it hits the State on Thursday night,” he said. The cyclone’s speed might lessen when it hits Mizoram but unprecedented heavy rain is predicted for the northern parts of the State, the officer said. With Cyclone Mahasen likely to hit the northeast state on Thursday night, the Mizoram government has decided to close all schools on Friday and declared a half-holiday on Thursday. State Education Secretary K Lalnghinglova told PTI on Wednesday that a circular to this effect has already been issued and circulated to the head of the institutions of government schools as a precautionary measure. Lalnghinglova, however, said the government had not taken any decision to close government offices. Meanwhile, Principal Scientific Officer of the state Planning Department's Science and Technology wing Vanlalzara said the cyclone was not likely to hit northern parts of the state. 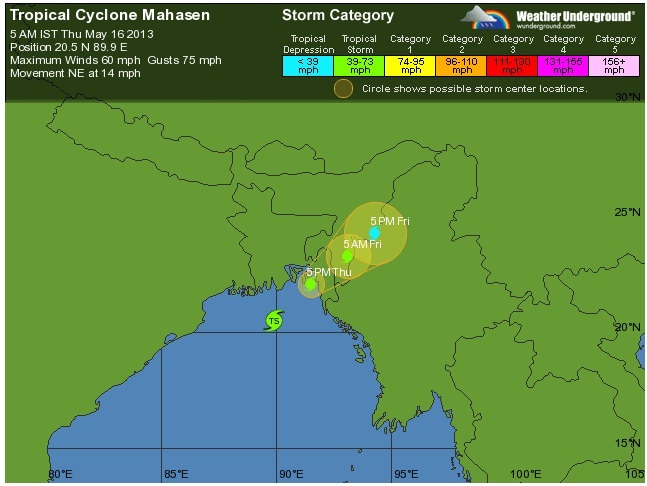 Quoting data from the Regional Meteorological Centre in Guwahati, Vanlalzara said Cyclone Mahasen was likely to hit the southern part of the state - Lunglei and other southern districts. "Though we have received information that the cyclone picked up speed, we hope that it would eventually slow down when it hits the state on Thursday night," he said. The Mizoram government declared a half-holiday on Thursday as a precautionary measure. The cyclone's speed might lessen when it hits Mizoram but unprecedented heavy rain is predicted for the northern parts of the state, the officer said.